Jaded Blossom: Guest Designer Stacey! Hey there Jaded Blossom Fans!! I hope you are all having a terrific Tuesday!! 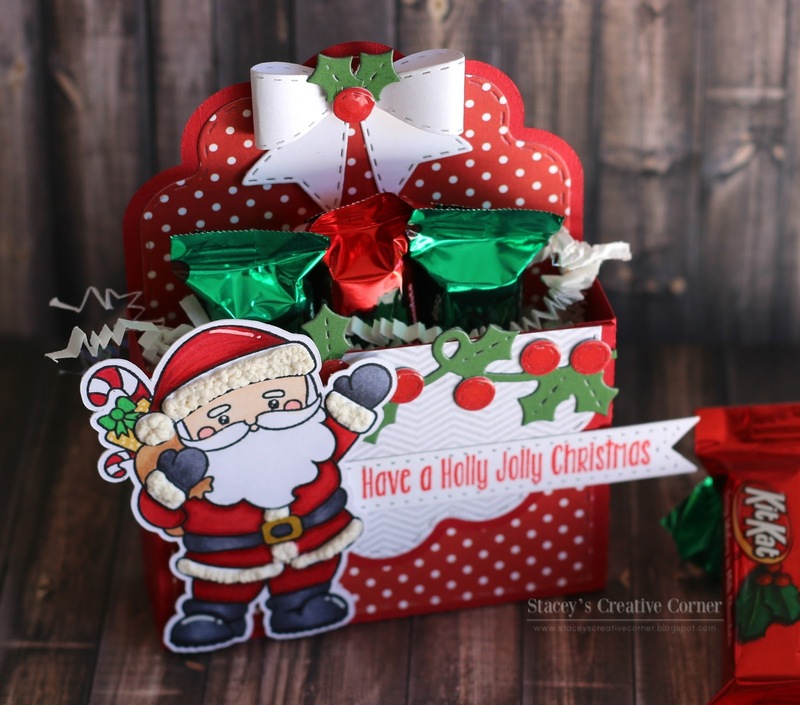 Stacey from Stacey's Creative Corner here today taking over the blog as one of Jaded Blossom's December Guest Designers!! Woo Hoo!! I decided to make a fun little treat box that would be perfect to give to a friend, neighbor, co-worker, postman, teacher, etc. I created my box using the Scallop Caddy Die and decorated it with some fun patterned papers. I added a fun little holly border using the Christmas Banner Dies to the top of the front panel and added some glossy accents to the berries. Next up was Santa!! I colored him from the Holly Jolly Christmas stamp set and added some liquid applique to the white parts of his suit and puffed it up with my heat gun for some dimension. He was added to the front of my box with some foam tape. I stamped out my greeting, also from Holly Jolly Christmas, onto a flag from the Card Layer Dies 1. I tucked it a little behind the Santa, making sure it hung off the edge of the box on the other side. I added a small bow from the Bow Dies and added some holly to the middle. I think it turned out so cute!! A big thanks to Michelle and Candace for allowing me to take over the blog today and be a guest designer!! I had so much fun making my project!! I hope you all have a great crafty day! 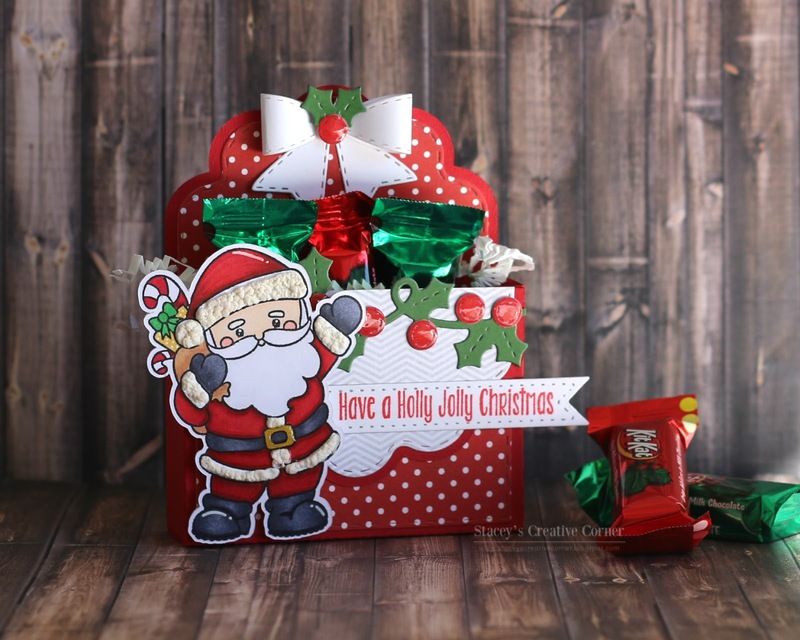 Fabulous Santa treat box. Looks awesome! This is SO SO CUTE! Love the white bow all decked out with the holly leaves! Beautiful! Congrats on your GD spot!! That little santa is such a cutie! Great project! This so darling! Simply adorable and festive! Aaw, what a darling treat box! I love the Santa..so jolly! Oh this treat box is perfect! Love it! Design Team and Guest Designer Announcement!